Apple today announced the 4.7-inch iPhone 7 and 5.5-inch iPhone 7 Plus at its "See You on the 7th" media event in San Francisco. The new iPhones feature a 64-bit four-core A10 Fusion processor, stereo speakers positioned on opposite ends of the device, a flush Force-sensitive home button with a Taptic Engine for haptic feedback, and IP67-standard water and dust resistance – but no headphone jack. Wired Lightning in-ear EarPod headphones and a Lightning to 3.5mm adapter are included in the box. Apple is offering Siri-enabled wireless earbuds called AirPods as a separate accessory, available for $159 in late October. 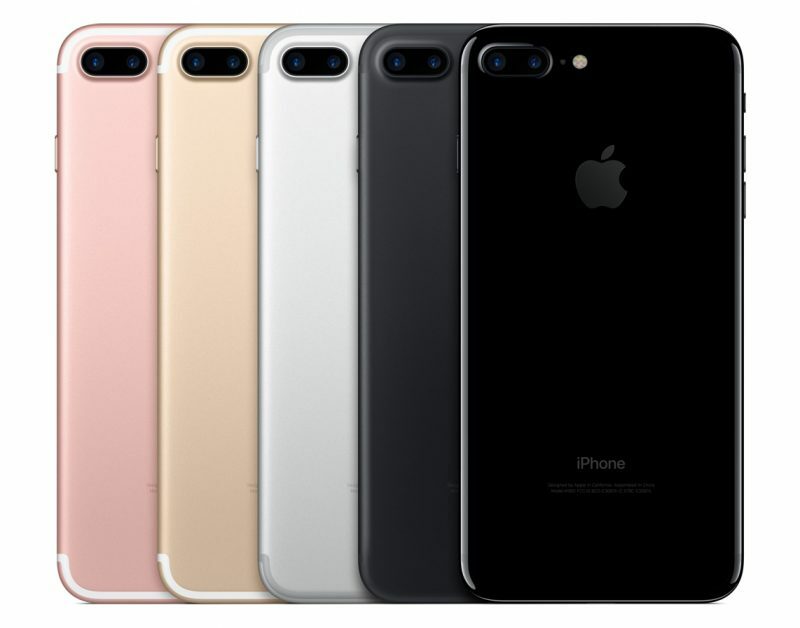 The iPhone 7 features a faster, more energy efficient 12-megapixel rear-facing camera with optical image stabilization, six-element f/1.8 aperture lens, an artificial light compensating flicker sensor, Quad-LED True Tone flash, and enhanced tone mapping. The device also has a 7-megapixel front-facing FaceTime HD camera with wide color capture and auto-image stabilization. 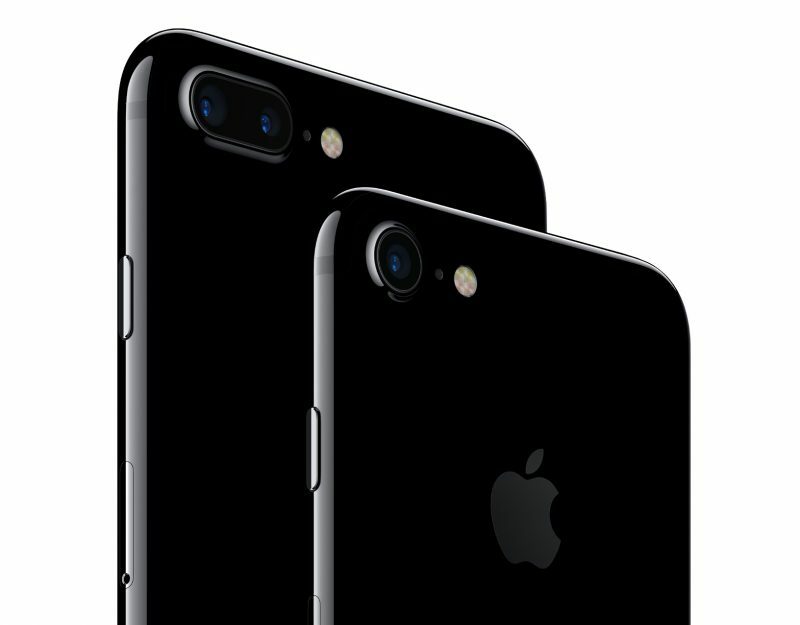 The iPhone 7 Plus differentiates itself from the 4.7-inch handset with a dual-lens 12-megapixel camera featuring all the same features, but is much more advanced, including a wide-angle lens and a separate telephoto lens that combine to create 2x optical zoom and 10x digital zoom features. The ISP dual-lens camera is also capable of producing live shallow depth of field shots and "bokeh" effects in preview mode. The smartphones are crafted from anodized aluminum and have a stainless steel Apple logo, and come in a new glossy jet black color, as well as simple "black" (with a black Apple logo), alongside silver, gold and rose gold. The antenna bands are aligned along the edges of the handsets, instead of across the rear like on the previous models, and the volume buttons are positioned directly on the side of the handset (as opposed to inside a recess as per the iPhone 6s and 6s Plus). Both devices also benefit from a 25% brighter "cinema standard" Retina HD display with wider color gamut, improved color management, and 3D Touch. Audio has also been improved with the new speakers, which include increased volume and better dynamic range. The A10 Fusion four-core processor powering the two devices delivers up to 40% faster CPU performance, up to 50% faster graphics performance, and better efficiency compared to the A9 chip inside the iPhone 6s and iPhone 6s Plus. Both the new smartphones come with improved battery life, faster wireless, and the improved water resistance means the iPhones stand up to splashing and even short periods of immersion in water. Pre-orders begin Friday September 9 and the devices are available to buy in more than 25 countries from September 16. iPhone 7 starts at $649 and comes in 32GB/128GB/256GB capacities. The iPhone 7 Plus starts at $769, also in 32GB/128GB/256GB capacities. All come pre-installed with iOS 10, which is also available for download on September 13.
iPhone 7 and iPhone 7 Plus are also available through the iPhone Upgrade Program, starting at $32/month and $37/month in the United States respectively. Apple said the iPhone Upgrade Program will be expanding to the United Kingdom and China. No headphone jack, no thanks. They are providing you an adapter free of charge. And they're moving into the fully digital world. To me it sounds like a win-win. It had to happen sometime. I'd say courage is accurate. Not buying. Waiting for next year's redesigned iPhone 8. Jet Black is gonna look so good in whatever case I put on it. From the photos, it doesn't look like you can charge while listening to headphones. If true, that's a pretty huge downside. The only option would be to spend more money on wireless headphones of some kind. Black, 128GB, 7 Plus. Ready for Friday! No more $199, $299, $399 thanks to the extinction of subsidized contract prices. The day finally came.